Songs can have great personal importance –I try to render these ideas understandable to the public. Whatever value or energy a song has, I try to make it palpable for the listener. I stop when I think the magic is most potent. I think about creating songs and videos that might resonate differently with people at different stages of their life — as if the whole time the music was speaking to them as a kid and as an adult in the future, like that movie, Interstellar. Yesterday marked the premiere of the 12th single by the Los Angeles-based group, Mista Cookie Jar and the Chocolate Chips. CJ Pizarro, aka Mista Cookie Jar, has become a veritable “music man” in the family music genre, with a new single drop every month for the past 12 months. Pizarro has not only written and produced the songs himself, but has also produced the accompanying artwork featured with each release, and in videos. The latter of which has been a cooperative effort with his family, who also make up “The Chocolate Chip” portion of the group, i.e. the lovely Miss Ava Flava and Lucas. In celebration of the song-a-month project’s closing, I am pleased to present the following interview with Pizarro who talks about his concept beind the “song-a-month” project and how it has helped him stay relevant and close with his audience, family as collaborative partners, and what’s next. There’s even a little hint about the group’s final, and ultimate single, which suggests 13 really isn’t so bad. CP: Initially, we (the Chocolate Chips and I) dropped our singles during the holiday season, hence, “Halloween Every Night” (October), “Gratitude” (for November) and “Got the Spirit” (for December). Since then, we have continued the “song-a-month” concept as a way to work on a new album at a comfortable pace while staying relevant to our audience. This gives me enough time to let each song mature organically. I noticed some of my favorite tracks are deeper cuts. As to be expected, fans will often only know our videos or singles. Releasing the songs individually is a way to give them a nice spotlight. Each song is its own world and, in a sense, its own album. Releasing the songs as singles, or in EP’s, gives me more time to let their deeper meaning sink in. As an artist, this process also helps me see which context the songs would work best in when I put them into an album. When the next album drops, we’re hoping folks will know most of the songs already and understand immediately the diversity of our sound. The album should cover several moods and seasonal feelings — ideally, a direct reflection of what our fans respond to most. KCG: How would you describe your aesthetic? CP: In many ways, I’m just writing love songs, but not the lovey-dovey kind. The family kind. The friendship kind. The parental kind. The cultural kind. You could even say the spiritual kind. I’m interested in memory, childhood, nostalgia and the importance of the imagination. I try to reach for originality, preserve innocence, and have fun! I am a big believer in laughter as a way to uplift and clarify. I think about things like, “Is love contagious? What are the forms of family love, community love?” I’m interested in the line between poetry and music. The landscape poetry inhabits, I try to inhabit that world in song. Poets from Walt Whitman to Saul Williams inspire my creativity. I guess I’m just scratching the surface of what inspires me. Love, family, and culture — that is my inspiration. Neil deGrasse Tyson inspires me. KCG: How do you move from an idea to a finished piece? CP: For each song, lyrics and music are channeled differently. Sometimes the lyrics are inspired by an emotion, and sometimes they flow from an intellectual concept. I love deep, intricate songs but sometimes a throwaway song or a kitschy touch can be just as timeless. I’m just speaking about how the song(s) of my life have carried me artistically to new places, how it has meaning both to me and in the context of a bigger world. Songs can have great personal importance –I try to render these ideas understandable to the public. Whatever value or energy a song has, I try to make it palpable for the listener. I stop when I think the magic is most potent. With all my songs, I go through several drafts. I will mix it down and bring the mp3 to my car for a good listen. The Mrs. and I give it a good listen. And when both of us think it’s “there” we stop. If it’s not there, we EQ or add instruments. With “The Way We Gets Down,” the song seemed to be banging up to that last verse. It started to feel a bit repetitive even though there was a fresh set of lyrics. Then it dawned on me after several listens, it needed an extra kick to give it the feeling of progression. So I added some kazoos. That did the trick. KCG: Ava Flava and Lucas perform with you, with Ava being a long-time vocalist for “The Chocolate Chips.” How big of a role does family play for you in your work? CP: My family is my biggest muse. Being a father gives structure to my work, though the role is constantly shifting. Fatherhood is a life long job. My step-kids are 11 and 14 now. Being a loving role model and support to them is the biggest priority for me. Being there for all the friends and family in my life informs my music. Painting the landscape of what family life is like, what universal love is, seems to be my calling. I always wonder what speaks to people musically? What speaks to my kids now that they’re older? Even just on an audio level — what sounds move them? What do these sounds mean in the context of society? In the context of lyrics? KCG: Do you bounce ideas off of one another? CP: I’ll often ask my kids and the Mrs. about what a word or a phrase means to them, and I will steer the song in a particular direction based on their answers. I bounce all my ideas off of Mrs. Cookie Jar. Generally, she’s great with the bigger picture questions. I am very detail obsessed. Though our roles often switch, we’re basically each other’s devil’s advocates. She’s not a musician, so she has a good objective eye as to what the music is really doing versus what it THINKS it’s doing. She can hear a song for what it is. Since I’m a musician, I like to pick it apart and dissect what’s going on. Sometimes a song can work on this esoteric level but sound really crappy to your average listener. I’m trying to get it to work on all levels. Ultimately, we try to weigh all sides of the argument – will it connect with kids? Will it connect with parents? She’s quite the visual artist, as well (and the best hairstylist I know). She has great eye and ear for balance. We have a solid artistic partnership. As for the kids, I take their musical tastes very seriously and keep it in mind when songwriting. When their tastes challenge my own tastes, I think, “Now there’s something important to learn here!” What I consider the most is when they go absolutely gaga over a certain song on the radio or a certain band. I wonder to myself what the magic is there, how that feeling can be translated through the lens of The Chocolate Chips’ world? I think about this as a way to steer our music in the direction of what gets their gears turning. Ultimately, it becomes about how “pure love” is the lasting truth. We all know this. The journey, the music that is discovered and the reality of how it manifests is what counts. KCG: How do different media formats complement each other in your work and in your life? CP: I approach the visual, lyrics and music with equal value. I really like to make music videos. Music and animating were childhood dreams of mine. I dreamt of making cartoons maybe even before I dreamt of being a musician. At age 10, my uncle got me a giant Disney animation behind-the-scenes book. I was fascinated by their creative process. In general, I am fascinated by the creative process. To me, it doesn’t get more magical than to have these drawings and visions come to life. As a super young kid, I really wanted to be an artist. I was really competitive with my peers, and there was always one or two kids who could draw better than me. I eventually learned to let it go, and in my teens I embraced punk rock. I learned that you didn’t have to be the best at something to be expressive. You just have to be you. You have to be honest. Now, that I’m a grown man (questionable), I enjoy animating again, immensely. KCG: Who/What are you influenced by? CP: Aesthetically, there are a lot of artists that I admire. I see my art as an extension of what inspires me in life, and culture. I am a pretty big cinema fan. Werner Herzog and Harmony Korine are my dudes when it comes to the cinema world. Animation wise, Miyazaki is a hero. The Simpsons were a big influence on me as a child, and I think Adventure Time is genius. I’m hugely influenced by Björk too, and how visually integrated her “character” is with her music. How her artwork is like a clue to how to listen to her music. Naturally, merging visual and audio excites me. Ultimately, it’s about poetry to me, and bringing the inner world to life. There are many ways to do it. Kids, and most folks for that matter, respond to visuals more immediately. How something is revealed to the eye will have a great affect on how it is understood in the ear, and ultimately in the heart. Musically, I strive to have the audio stand alone. Visually, I try to take the music deeper to whatever place it needs to go. I do have some film ideas though — stuff that goes beyond the music video realm. It’s going take a lot of work still, but I’m excited for the future! KCG: What is your relationship with social media? Does it help or hinder your creative process in any way? CP: Because of the nature of our world these days, with social media and the internet and so much cultural overlap, I’m trying to honor what I love about all these worlds and connect them together in one single vision while at the same time being honest with whatever music/poetry exists inside of me. A lot of my stuff has this kind of genre blending thing going on. Visually and cinematically, this appeals to me. I think about what music would have made my younger self’s mind explode. Being exposed to something awesome for the first time is a sacred thing that has a lasting impact. I try to create art with this lasting impact in mind — have it be something that grows over time and throughout the rest of one’s life. I think about creating songs and videos that might resonate differently with people at different stages of their life — as if the whole time the music was speaking to them as a kid and as an adult in the future, like that movie, Interstellar. Being Mista Cookie Jar, what this character stands for, and the whole concept of the Love Bubble— is a way of life. It’s a lightness and deepness of spirit at once that I believe is my calling and offering to the world. KCG: Now that you have released 12 months of singles are you going to continue another round? What’s next for you? CP: October 13th will be the date of our last single-a-month. It’s the anniversary of our first single, “Halloween Every Night.” It’s perfect because the song I plan on dropping is about facing fears — nightmares, superstition and the like. I don’t wanna give too much away yet, but it’s wonderfully synchronous how it will be our 13th song on the 13th day of our 13th month — October! Both our albums have 13 songs and despite the superstitions surrounding the number, I think 13 gets a bad rap. In general, however, I will not stop dropping singles. We are ending the routine because I don’t want to be confined to the single-a-month routine. I want to have the freedom to be unpredictable again. Work on videos, work on 5 songs at once. Who knows, in the future I may drop more than one in a month! As for an album, it’s coming. Certain singles you’ve heard will be on there, maybe one or two done a bit differently — and some new material as well. We’ll see. I don’t really know yet. I am letting it simmer — I want it to be just right. Over the past 12 months, CJ Pizarro (aka Mista Cookie Jar) and The Chocolate Chips, have been producing music magic with a new single each month as part of their “song-a-month” project. The topics the songs have touched upon range from up close and personal, i.e. “Mama,” “BFF Goodbye,” to more general themes like holidays (“Jelly Beans!”) and dreaming big (“Hold On to Your Dreams”). With each new effort, it has been a treat to hear the gamut of styles Pizarro has made his own (from hip-hop to singer/songwriter to Motown to a whole blend). As a kids’ music blogger, it has been wonderful to be a part of the challenge that Pizarro has taken on, and witness the creative growth that has come out of it. As a parent, and a mom, I have been touched by the heartfelt themes and relevancy of the songs’ to my experiences with Emily; But that’s the power of music, and what today’s audio premiere is all about. 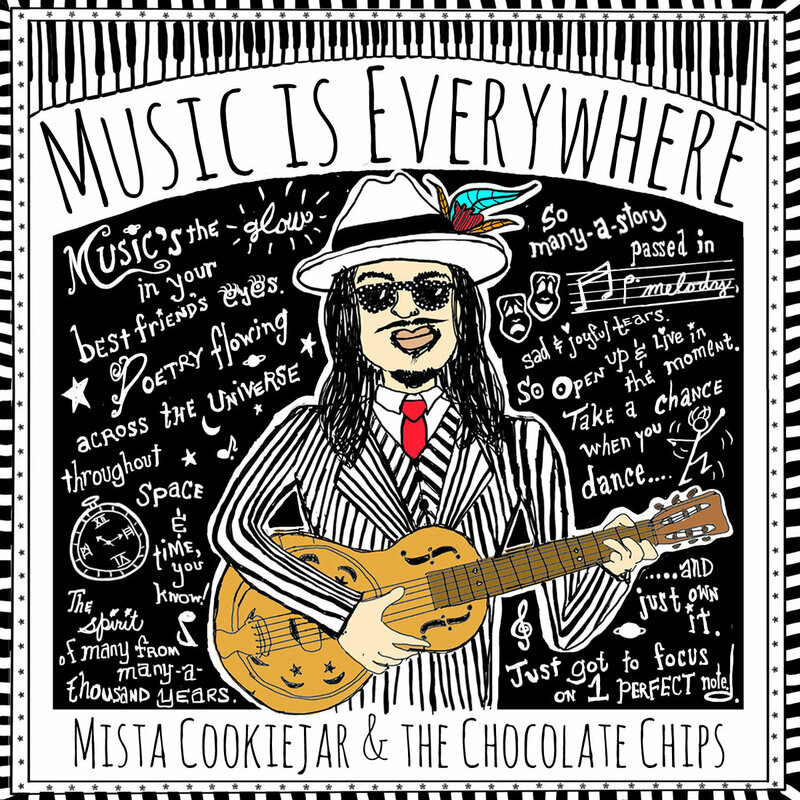 As an homage to the magic of song and dance and the notion that “music is always at our fingertips,” I am proud to present “Music is Everywhere,” the penultimate single in Mista Cookie Jar and the Chocolate Chips’ song-a-month marathon. Opening with a flutter of piano and lovely birdsong, “Music is Everywhere” starts off like a dream sequence and continues on with rhythmic buoyancy in a “Sound of Music inspired, rasta-flavored wave.” The vibe of this arrangement is a perfect complement to the song’s message which celebrates the power of music and the innate connection we have to it; The notion that music exists within us and all around us, whether it’s in a poetic verse, an ocean breeze, or that one perfect note. Stay tuned here for a follow up interview tomorrow with Pizarro who talks about his experience with the song-a-month project and some of the influences and inspiration behind it all. You can download “Music is Everywhere,” through the Bandcamp widget below. Be sure to check out the lyrics, and additional singles by Mista Cookie Jar and the Chocolate Chips at their Bandcamp page. What do you get when you mix a popular San Francisco Bay Area-based children’s singer/songwriter and performer, a farm, some puppets and a couple of apes? If you guessed the world premiere video for “Turkey in the Straw,” a single from Andy Z’s latest album, Classic Songs & Traditional Tunes, then you guessed right! Though if you guessed a new spinoff of Planet of the Apes you could be close. Filmed on location at the lovely Ardenwood Historic Farm, in Fremont, CA, Andy Z (with a special appearance by the Andyland Band) presents one of the most popular singles from the album. As someone who has had the pleasure of working with and getting to know Andy, I am pleased to present this video as it so accurately represents the reason why Andy has been greatly successful as a children’s musician and entertainer. 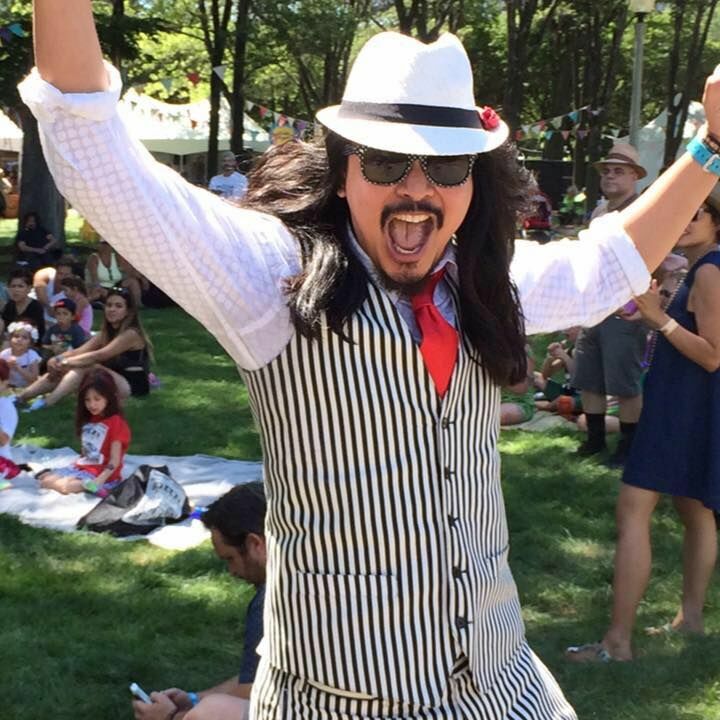 HIs charisma and playful sense of humor regularly brings delight into the musical experiences he creates for families. Those familiar with Andy Z’s live show and existing catalog of music videos will recognize a celebrity puppet friend, i.e. Rasta Froggy, who graciously donned a wedding veil for his role. Eager to present the most authentic renditions, Andy spent hours researching the original verses of the songs featured on Classic Songs and Traditional Tunes, With “Turkey in the Straw” in particular, Andy found that there weren’t many music videos featuring all of the song’s verses and words, and thus the idea to create his own was born. Add in a little jocularity mixed with an ode to Sci-Fi and you’ve got the right formula for today’s premiere! 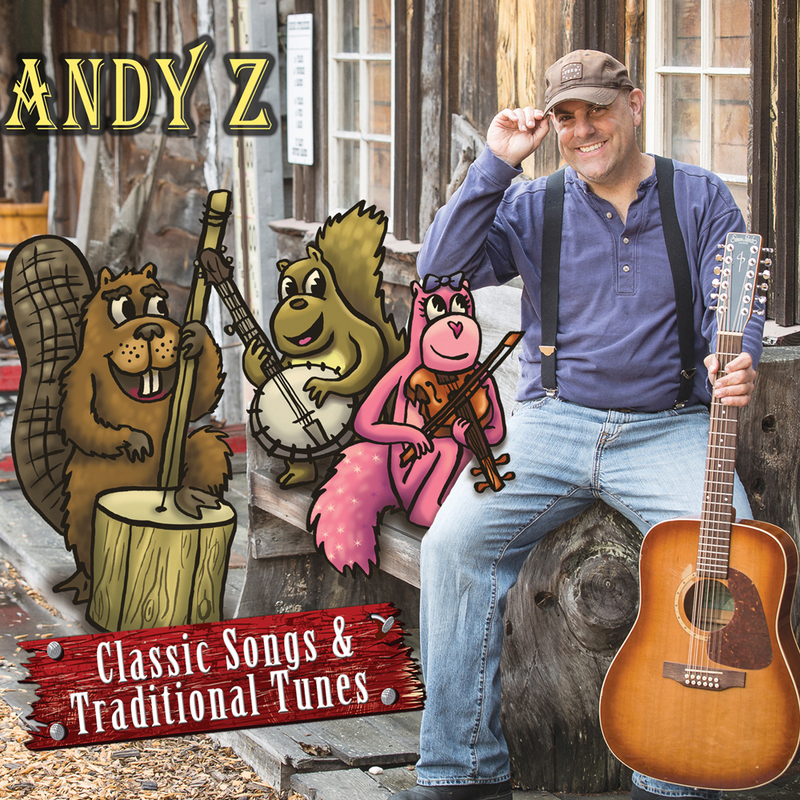 Andy Z’s Classic Songs and Traditional Tunes is the winner of a Parents’ Choice Silver Award is available via CDBaby, iTunes, Amazon and Pandora. Keep up with Andy Z through his Facebook page, and if you are in the SF Bay Area, check out one of his shows. 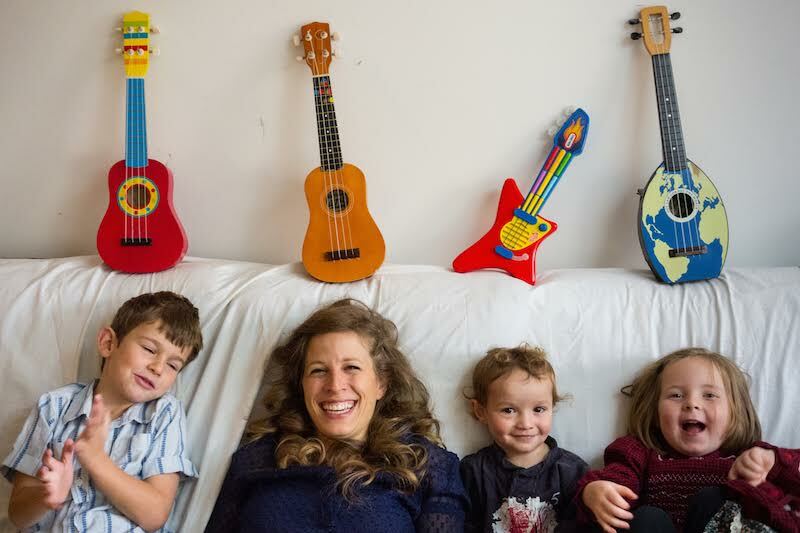 Vered Benhorin of Baby In Tune has been featured here on Kids Can Groove before and it’s always refreshing to hear what she has to say. Her recent album, Hello My Baby, released earlier this year (and winner of a Parents’ Choice Gold Award), still offers a sense of comfort and support for me as a parent. 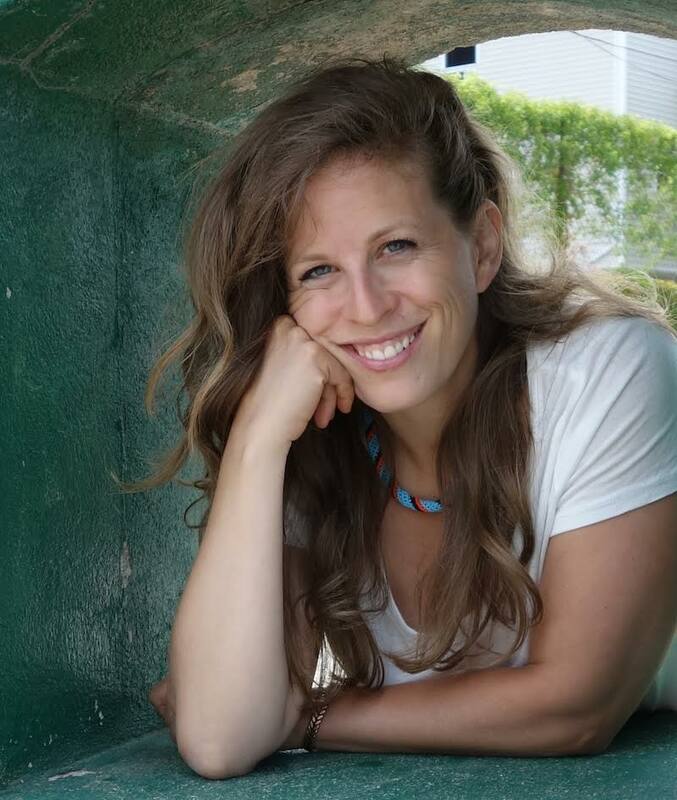 This is in no small part due to the fact that Vered is regularly talking to and listening to what families through her workshops and classes. She also explores her work in her own life as a mom of three. During the production of Hello My Baby, Vered was pregnant with her third child. This presented her with a unique opportunity that brought a dynamic perspective into her work. In today’s guest post, Vered writes about her experience with her daughter when they traveled across the country to celebrate the release of Hello My Baby. 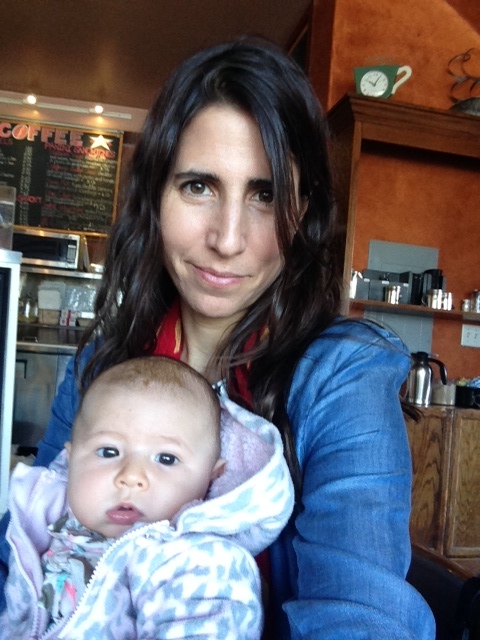 Though the below post largely chronicles her experience with her baby, Vered also touches upon what I grapple with a lot – my identity as a mom, and my identity in a greater sense related to my profession/work and my personal ambitions. It’s a delicate balance and it’s reassuring to know that others feel the same way. Vered is a no BS writer. I love how she shares her thoughts honestly and with a sense of humor, which is an essential tool for parenting. 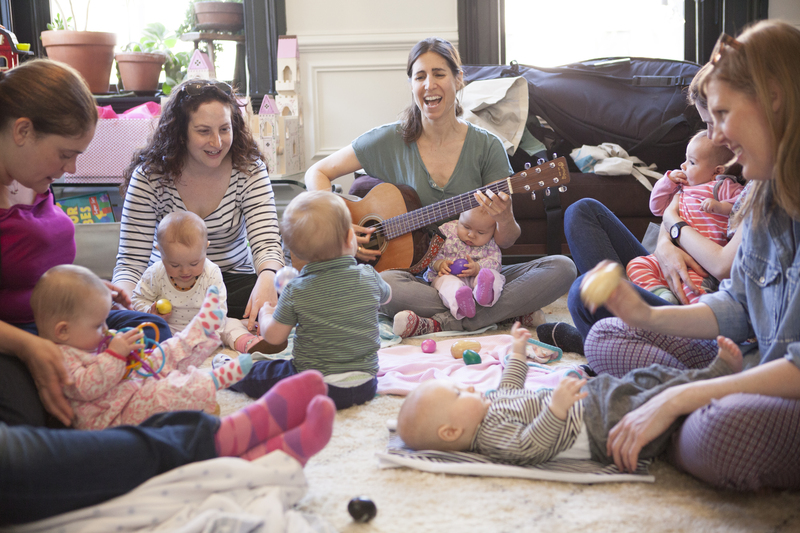 Visit Baby In Tune to learn more and read additional posts by Vered. If you are in NYC you can find info on how to attend/hold a workshop or class, as well as view videos of her in action. Last April I went on a west coast tour. Like a rock star I strapped on my guitar, packed my amp, my microphone, and my cutest dresses. I also packed diapers, a carseat, a stroller, bottles, endless onesies, rattles, snacks, and wipes. A little less like a rockstar I trekked through the halls of the airport wondering what I had done. I decided to take a 5 month old roadie because leaving her with my husband and two sons was not an option. Somehow it also didn’t seem like an option NOT to do the tour. I had just released my second album for families and wanted to get it out there. But anyone who has a baby knows that while jetlag is an annoyance for grown ups on their own, it is hell on earth with kids. So every night as we played together in the dark at 3am I kicked myself for being hard-headed, overly motivated, unrealistic. But as we fell back asleep snuggling together in the cold AirBnB bed I held my little portable heater and felt her sweet breath on me, the breath of life itself, and we fell asleep smiling. As I ran out at the end of shows to nurse her and lugged her carseat from place to place I felt annoyed and exasperated. And as I looked into her eyes and she flashed me a smile between shows I felt energized to do the next, and the next. For me, having a third baby almost felt like a professional decision. I rationalized that I HAD to have the baby in order to give me material for another album. I had to experience a baby again in order to gather more first hand research for my classes and feel more inspired. I know that sounds a little crazy – having a baby for professional reasons? Normally a baby is nothing but an obstacle. I feel lucky that my career has been able to develop with my life choices. As a single woman I wrote about romance and existential angst. 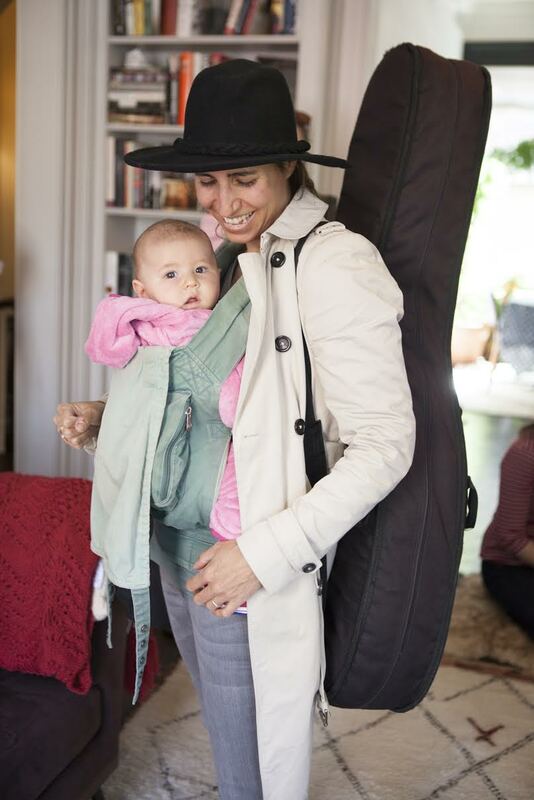 As a mom my songs became about my experience as a parent and my perception of how my babies felt. I was also able to implement my studies in music therapy and psychology to help parents and teach them how to use music to bond with their babies. My life as a mom integrates really well with my life as a therapist/musician, but there is no perfect union. To push my luck, I took my daughter with me to a bunch of workshops that were with babies her age. As a group leader my job is to facilitate discussion, be very aware of the group’s emotions and be able to support them through music. With my baby there at times I felt like I was less available to really listen fully to the group members. And yet at the same time I could identify completely and that helped me bring in the right songs, ideas and exercises for each class. Even in the most seemingly perfect situation the needs of the child conflict with the needs of the job. So now that my baby is 10 months old I look back and ask myself – has she actually helped me professionally? I think the answer is the same answer any mom would give. Yes, she has inspired me. She has broadened my perspective in so many ways, and has contributed to my creativity, both as a therapist and a songwriter. But when I am with her I don’t want to be working. I don’t even want to be writing a song. Most of the time I just want to be hanging out, watching her play, following her lead, mirroring her vocals. Every now and then it all comes together. That’s when she sings with me on the subway on our way to a group, or she inspires a new song (stay tuned for the song about our west coast tour) , or she teaches me something new about what babies need at each age. In those moments I am so happy that I have the chance to take my kid to work and even to make my work about my kid, even if she adds a whole lot more work. …Most hurt and pain that culminates in violence or mistreatment stems from people not having the confidence or support that they needed as a child. It all starts with the children and giving them the love that they need to succeed in life. Amelia Robinson aka Mil’s Trills is a Brooklyn-based singer with a long list of artistic roles such as songwriter, producer, composer, and educator whose dedication to creating a musical landscape in which everyone, regardless of race religion or anything else that deviates from “the norm,” can be a part of is admirable. September 23, 2015 marks the official release of the second Mil’s Trills album, Now That We’re Friends…, which delivers a barrel of authentic, down home musical goodness filled with encouraging messages founded upon the notion that we are all part of the same community. We are all friends. It’s delightful and that is in no small part due to Robinson’s integrity as a musician and her dedication to providing the most meaningful experience for her audience. What comes through most clearly is Robinson’s infectious energy and positivity. In honor of the release of Now That We’re Friends…, I am so pleased to share the following interview with you. Throughout her life, Robinson has been influenced and inspired by her surroundings. Born and raised in Brooklyn, there has been no shortage of variety from which to draw inspiration from. Robinson has also spent time traveling the globe, further feeding her artistic, creative soul. One of the many things I really love about this interview is Robinson’s candid, honest responses. Just like her music, she presents herself unabashedly and wholeheartedly. Robinson shares about her international roots, the origin of the name “Mil’s Trills,” her time in Saudi Arabia with her ukulele, the meaning behind the “I’m in the Band” stickers she gives out at her live shows, how a tragic event and the healing power of family helped kick off the creation of Now That We’re Friends…, and how she met Jonathan Blum, the painter responsible for the beautiful work on both of her album covers. The list of interesting talking points could go on! For now, I know you’ll enjoy getting to know “Mil” as much as I have. Kids Can Groove: You were born and raised in Brooklyn, and you’re very much a part of the Brooklyn community. How has that impacted you as an artist? AR: Growing up in an urban culture has exposed me to a wide range of styles, cultures, religions, ethnicities, and genres. It’s allowed me to embrace who I am as an individual by respecting others around me for who they are and how they choose to live. I am somewhat obsessed with the similarities and differences we have as humans, and much of my work is based on a response to that and figuring out how we can find a uniting common ground and weave the threads that sew us together. KCG: Why, before starting Mil’s Trills, did you embark upon extended world travels to places like. Kazakhstan, Guatemala, Israel, and the UK? AR: I come from an international family (my parents are Australia / NZ immigrants), so traveling has always been in my blood. We were given a lot of independence as kids and always encouraged to see the world and all it has to offer. We flew down under every other year for most of our childhood, but unfortunately I grew a serious fear of flying that grounded me for 11 years. I didn’t get to go abroad like my siblings had, so by the time I graduated college, I was chomping at the bit to get out of the country! I went to a few “Fly Without Fear” group therapy meetings (that’s a whole other story) and worked my way up to a flight to DC, then London, and eventually back to Australia. A big part of my “recovery” was facing my deepest fear – the fear of the unknown – and building confidence to grow and develop as a young adult. A series of opportunities presented themselves to me (a medical mission to Guatemala, my brother serving in the Peace Corps in Kazakhstan), and I took on each challenge with the biggest tool my parents gave me – a great passion to live life to the fullest. They also gave me a few citizenships, so that surely helped when it came time to take a bigger jump and move to London to “find myself” as an artist and composer. From there, I eventually got hired to play ukulele on an artificial island in Qatar, which was a crazy experience. By the time I got back to Brooklyn I had all these experiences from which to draw inspiration. I had somewhat learned what kind of person I wanted to be and how to apply my skillset to a craft in which I felt fulfilled. I think travel is the most important gift one can give oneself, especially in those years after college when you’re still figuring it all out. It teaches you how to be self-sufficient, find solutions, and see the greatness of humanity, while eliciting courage, bravery, and confidence that will enable you to take on challenges throughout the rest of your life! KCG: You love the ukulele! How did you get started with that, and what do you love about the instrument? AR: I got started playing the ukulele around 2006, I think! A friend handed it to me and said “You’ll love this!” and he was right! He took me to an underground cabaret in the East Village, and I was hooked! I loved the community that was built around this little instrument, and its ability to make anyone smile in an instant. It was also MUCH easier to carry around than a piano (my first instrument), so I clipped it onto my backpack in all my travels. I found it a great icebreaker and made a lot of friends by whipping it out on top of mountains and on street cafes. 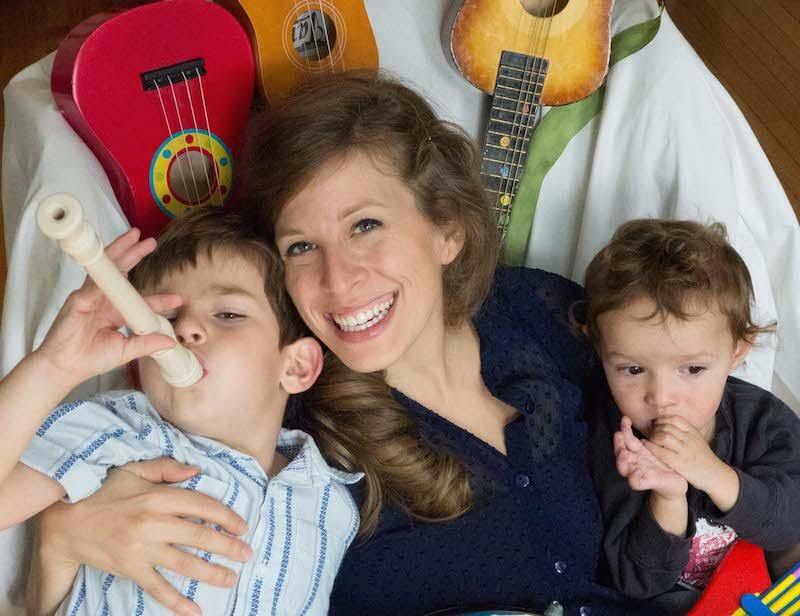 For families, it seems like the perfect instrument because it speaks to all ages in a special way. It’s accessible, welcoming, and makes people happy! What’s not to like? KCG: How did Mil’s Trills come to be? What’s the source of the name? AR: Mil’s Trills was fashioned after the musical experience I had as a child with a wonderful teacher of mine, Judy Bain. She led a tight-knit group of kids who took weekly Suzuki lessons and were involved in her choir, the Brooklyn Children’s Ensemble. She also organized numerous retreats that we’d go on every year. We were all extremely dedicated – to the music and each other (I was involved from the age of 3 through high school!). It was a really special thing, and we’re all still really close to this day. It was that kind of community that inspired me to try to recreate that same sense of belonging for the next generation. My sister, who also shared the Judy Bain experience and had just had a baby girl, was the real inspiration for the whole project. She helped me sculpt a framework that would continue the tradition and pay it forward as best we could. As for the name, well my nickname is Mil (as a kid, my younger brother couldn’t say my full name, so he just called me Mil because it was easier). ‘Mil’s Trills’ actually came from my college years – that was around about the time I started writing songs as gifts (college students have to be thrifty!). My dear friend Lona, who was in an a cappella group with me, used to call my original ditties “Mil’s Trills,” and so years later when it came time to find a name for my project, she brought it back up again and it just felt right. I remember having pages and pages of scribbles with random names of all sorts and struggling to make a decision because you know you’re gonna be stuck with it for years. People always get the l’s mixed up, but that’s ok – it is a bit tricky if you don’t know the story behind it! KCG: What distinguishes Mil’s Trills? What sets you apart? AR: I think most children’s musicians will say that their music comes from a very personal place, most often as a response to having children in their lives in some way or another. They will also say that their music is interactive and speaks to all ages. So what makes Mil’s Trills different? Well, for lack of a better answer – ME! Haha.. In this world we are all different and beautiful in our own way. We all have our own paths, and this is mine. My music, as heard through Mil’s Trills, is a constant exchange between received experiences and creative responses. It’s an extension of my being and my perspective on this world, and it will continue to change and evolve as long as I do. KCG: I’ve heard that at your shows you give stickers to audience members that say “I’m in the band.” How do you help people feel that they are actually part of the performance? Why does that matter? AR: So much of what I do is based around community and making people feel a part of something. I suppose this stems from growing up in a large and tightknit immigrant family (I have 3 siblings), and being accustomed to / finding comfort in that type of support system. Working with an early childhood population on various continents, made clear to me the global benefits of working as a group and being a part of a team. I would say that my role as a performer / educator is often more as a mentor than an entertainer. I often feel it’s most important to get down on one knee after a show and look a kid in the eye to acknowledge them and hear what they have to contribute. Maybe it’s the result of growing up in a big family that I feel a need to find my voice, and give other kids their individual voices as well. There’s a way for us all to be unique within ourselves and still be a cooperative part of the world as a whole! KCG: How have you grown, as a musician, through the years? How has this been reflected in Mil’s Trills? AR: I am a classically trained pianist. I grew up memorizing pieces by Chopin and Bach. I rarely steered from the notes on the page, unless it was bashing the keys during moments of frustration as a kid. It wasn’t until years later in college where I had access to a private rehearsal room with a grand piano that I actually started to experiment and form songs. Maybe it was the classical training, but I’ve always had very strong melodies in my head, and so much of my earlier stuff has been said to sound like musical theater! But then again, I think I also subconsciously picked up a lot of styles living in the city, and so I have a tendency to default to a lot of reggae, Latin, and Caribbean beats. There’s a huge world music influence, too, because music is so intrinsically connected to the cultural experiences I’ve had around the globe. It’s not only exposed me to new instruments that I’ve learned to play, but also other musicians to play with! When Mil’s Trills first started out, I was scheduling 5 different musical guests for 5 different shows a week, so each time I played the same song with each of them it sounded different and was infused with a new sense of life. I still work with a rotating cast of musicians for this exact reason – to improvise, keep it fresh and explore new sounds! KCG: You’ve performed in some amazing venues, including Lincoln Center in NYC. Tell us about your participation in the Meet the Artist series at Lincoln Center. What was that about? AR: It was definitely one of the most enriching experiences with students I’ve ever had. The program spanned over six performances for school age children K-2nd grade. It was amazing because I was given quite a bit of creative freedom. I could have done the same performance at each time slot, but I opted to use it as an opportunity to expand my show into a topic that I’d been yearning to explore – ethnomusicology! At each show, we featured a different family of instruments played by a different cast of characters from all over the world. The instruments were grouped into percussion, tuned percussion, string, brass, wind, and even electronic! I created worksheets for all the teachers to complete with discussion points and activities for the children to prepare in their classrooms prior to the show. Upon arrival, many of the kids had even made their own instruments in relation to the family that we were going to learn about that day. The kids came from all over the city – and even New Jersey – bringing their own school flavor to the mix, which made for some very energized and raucous shows! There were plenty of incredible spontaneous moments, especially when we “painted” music on stage in an improvised exercise with the winds and horns! KCG: Like many kids’ musicians, you also work as an early childhood music educator. How has this influenced you, both personally and professionally? How has it impacted your musical choices for Mil’s Trills? AR: Kids see the world through a lens of joy, positivity, and enthusiasm. Everything is NEW to them! And that freshness is so contagious! I feel so blessed to have the opportunity to work with children in the classroom, as it serves as a free play space that directly opens a dialogue for creative exchange. As the teacher, I provide a safe place – an environment in which I offer a sense of structure and framework, and the kids respond with bolts of creative ideas that then are morphed into songs, games, and activities. I have learned so much from them – from being present and open to spontaneity, to how to clearly communicate, embrace joyfulness, and channel the ability to freely express oneself. On a personal level, it’s taken me a long time to evoke this type of fluid conversation between my strategic mind and my creative soul – there has always been a very serious internal conflict. However, working with children has enabled me to embrace each facet so that I can be a good role model and my true-est self! I owe it to them to give them the best version of myself when I’m in the front of the classroom, and even when I’m on stage. My most current work is undoubtedly a reflection of that freedom to be open and expressive without inhibition. KCG: What are your suggestions for introducing young children to music? AR: DO IT!!! Music is an intrinsic conduit for expression and is an essential element of our natural world. Exposure to new sounds and music inspires kids to blossom and create a relationship with the world around them. It nourishes their ability to embrace their surroundings and find joy, and it’s so rewarding for the witnessing adult, too! Being exposed to music at an early age (and any age!) improves overall health, cognitive development, fine, gross and motor skills, literacy, and social emotional skills – it’s a no brainer! KCG: Tell us about Now That We’re Friends … What was the impetus for the album? How does it differ from/expand upon last year’s release, Everyone Together Now!? The album actually came out of a period of grief. In August of last year (2014) we tragically lost a close family member. I went through an existential phase of “Why are we here?” and found myself writing about pretty serious feelings of loneliness. I took a trip down to see my family in Australia / NZ for my cousin’s wedding and found the experience of being surrounded by so much family extremely cathartic and moving (I have a HUGE extended family down under). I was reinvigorated by the power of love and was inspired by the mere strength and support of family to transcend distance and time. It filled me with hope and healing, and I realized that life really comes down to LOVE. Not necessarily the romantic kind, but the appreciation for LOVING the world around you, and all that it has to offer. It’s the one thing all of us humans have in common. And the most important thing is to love yourself – because when you love yourself you have strength to grow and relate to others in a positive way that can help the world become a better place. This album is also very much about embracing differences and accepting cultural diversity. We are all wonderfully unique and approach our daily lives from various viewpoints and perspectives. A surefire way to get along is to practice thinking unselfishly and instead imagine what it’s like to be in each other’s shoes. This is my tribute to “peace & love, baby!” I also truly believe that every single person on this planet has something special that they bring to the table. In my opinion, most hurt and pain that culminates in violence or mistreatment stems from people not having the confidence or support that they needed as a child. It all starts with the children and giving them the love that they need to succeed in life. KCG: Many of us are in back-to-school mode right now. How can your music help children when they return to school, whether it’s transitioning from pre-school to kindergarten, from kindergarten to first grade, or from one school to another? AR: It’s so funny how sometimes a side of your art shows itself after you actually make it! I started Mil’s Trills about 5 years ago when my niece was 6 months old. Now, she and her friends who inspired this whole project are starting kindergarten at brand new schools with brand new kids. It’s kind of perfect timing for this album, because these songs are purposed to help us navigate the tender moments when we first make contact with another being. It’s a tool to help build confidence within one’s self to help us emanate compassion and acceptance and be able to communicate clearly with one another. Furthermore, school transitions can be very challenging times, and knowing that someone relates to those scary feelings can help you get through it! KCG: Your album cover art is stunning. How did you happen to meet the artist, Jonathan Blum? Tell us about your relationship with him and his work. RA: Jonathan Blum is a neighbor and friend who I met during the course of recording my first album. He is one of the only artists left in NYC with a storefront, and the intermittent hours he keeps always provokes interest from passersby! He’d been there for years, but the only time I saw him open was when I’d come home late from the studio at 2 a.m. I’d pop in and share my project with him each evening thereafter – and he came to hear each step of the process from start to finish. His art offered refuge and inspiration during the recording project and a friendship was born! After a bit of persuasion, he ended up doing my first album cover – which was really a collaboration because he let me do the collage underneath that adds the texture to the painting. It all fell into place, as his work is quite paralleled with my music – he paints playful images of such things as ostriches with strawberries on their heads that appeals to adults and kids alike – much like my songs. It was such an organic, beautiful friendship that bloomed – or should I say, Blum’d!… After the success of the Big Blue Moose (Jonathan sold every moose he made after that album cover), it only made sense for him to do the next record, as well! His website is rabbipainter.com. KCG: Can you share something interesting/funny that people may lot know about you? You can be as playful or as serous as you want here. KCG: What’s next for you? AR: I can’t wait to find out! Whatever it is, I certainly hope to be able to continue learning, growing, expressing, being creative, and trying to inspire others to do the same. I believe it’s important to also have music that engages not just the children but also the different generations that help to raise the children we love. Pointed Man Band is a Portland-based band led by Dan Elliott. 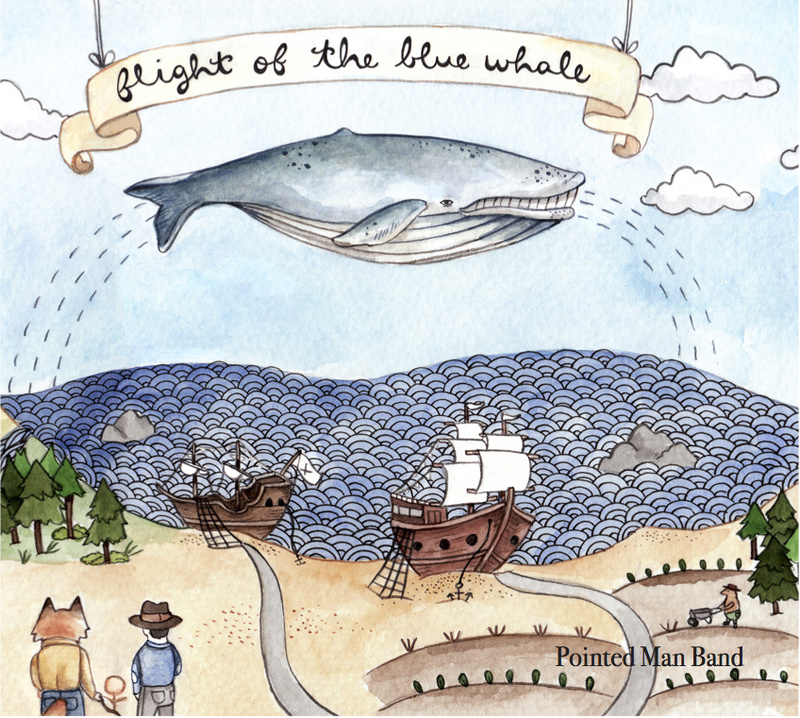 Earlier this year (2015), Pointed Man Band released its second album, Flight of the Blue Whale. Like its predecessor, the 2013 debut Swordfish Tango, Flight of the Blue Whale presents listeners with a rich tapestry of sound featuring an eclectic blend of styles that collectively illustrate the album’s storyline – a tale featuring a red fox and a Taupier (mole-catcher) who set out on a journey ultimately freeing a baleen whale from its curse. Along the way they meet mole pirates, drift with Swifts, and hear the beckoning call of a siren’s song (sung by Kay Elliott). Flight of the Blue Whale was an instant hit in our household. It’s eccentric and there is a meticulousness in the overall composition that captured my attention, in addition to the variety of instrumentation. When I initially spoke with Elliott I was intrigued to learn that he is a self-taught musician, though as we spoke more, it began to make sense. Elliott’s approach to making music is notably innovative. Waltzes serve as segues, buoyantly carrying the listener along while nontraditional objects are used to emphasize critical pieces of the story, i.e. drinking glasses sonically illustrating weightlessness when the baleen whale takes flight. I am pleased to share more about Elliott and Pointed Man Band with you. In our interview below, Elliott shares thoughts about the production of the album, his love of Waltzes and how his son is his biggest inspiration. KCG: What inspired you to start Pointed Man Band? DE: Pointed Man Band started when I was staying home a few days a week with my son when he was younger. Our play times, our jokes and some silly songs would always pop up and I would use his nap times to record these sketches and eventually an album. He slept through it all! DE: The name came from an album that I always admired, The Point! by Harry Nilsson and a character in the story “The Pointed Man.” This album was one that I consider to be the “outline” of what a children’s album could be in both content and lyrics. I chose to go with “Band” because I had hopes for the project to develop into just that. Live performances are often four to seven band members and we’ve even had a small middle school choir for one show! KCG: When did you start playing music? DE: I started playing trumpet in the 5th grade. I remember being fascinated by the idea of reading music and having that sense of empowerment with being able to initially become part of a group who could see shapes and turn that into sound. I had my first recording experiences with music in High School. I had always wanted to write my own songs and I had acquired a four track my Sophomore or Junior year. This kind of changed my life. It allowed me to listen to cassettes of The Beatles and others in reverse. It also introduced me to the idea of layering tracks, something that I am still guilty of today. So, it was pretty close to how it is now… A recording device, a pair of headphones, some instruments and an idea, usually put together at home. KCG: You composed and arranged all the music on FOTBW. As a self-taught musician, what is your approach to writing/producing music? DE: My wife and I talk about this a lot. As a self-taught musician, I’ve been told that I find it easy to think outside “the classical progression box.” I’m not even sure where I am “supposed” to be thinking according to broad music guidelines. I just play what I hear in the moment regardless of how a trained musician might perceive it. This is also part of the challenging aspects. Writing musical passages out in notation is difficult for me, but the musicians I am working with can often take it down for themselves. It is a goal for me to learn how to read and write music, and I plan on bolstering my skills in that area. KCG: What changed from your debut, Swordfish Tango, to Flight of the Blue Whale (“FOTBW”)? DE: It’s hard not to answer “Everything!” but having accessibility to a recording studio was a completely different type of environment for me. I found myself reaching out to musicians that I highly respect. Also, it was largely the patience and guidance of Kevin Drake, who recorded the album, that kept me in a calm and positive state of mind. It can be frustrating to have an idea and not execute it in the first few tries. KCG: Why did you go with a narrative for FOTBW? DE: Well, quite simply, I just really wanted to tell a story from beginning to end. I wanted to create an album that could potentially translate into a stage performance as well. When I started thinking about creating a new album, I only had a song about a Red Fox, Moles going on parade and a demo for a waltz that I titled “Flight of the Blue Whale.” As I began to write other tunes, I allowed them to become more or less what they wanted to be and then I set to work on sculpting a story line that captured the songs as a whole. 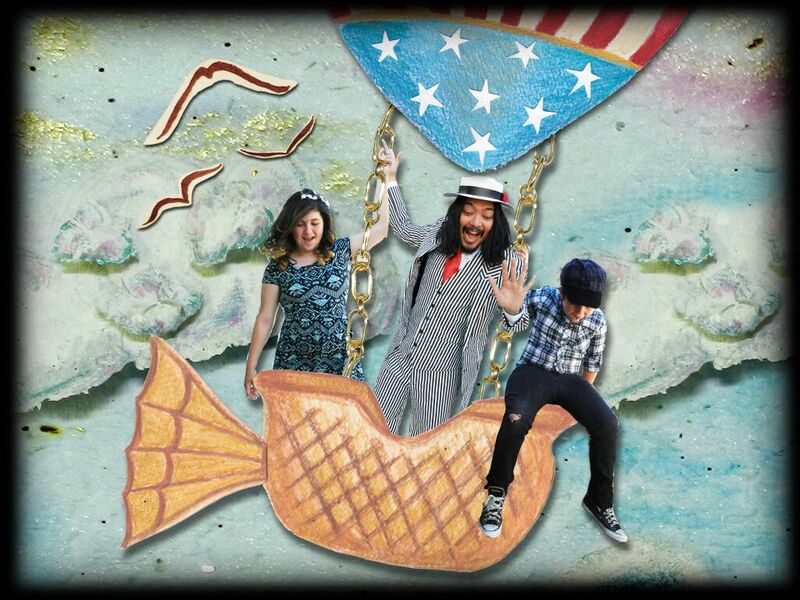 KCG: One of my favorite parts of the album is when you simulate weightlessness as the baleen whale takes flight. What was your approach to creating this significant piece of the story? DE: Space. The build up to the whale taking flight was trying to create the thought of how much speed and resistance it would take for a 50 ton creature to fly. Flight, as we think of rockets and planes, is loud. So, why wouldn’t it be for a whale? But what next? Space, clarity and beauty right? I have a soft spot for tuned glassware, it sounds amazing. KCG: Classical styles of music, such as Tangos and Waltzes, are included in both of your albums. What do you like about these styles? DE: Waltzes hold a very special place in my heart. I’ve always been thrilled by songs in irregular time signatures and despite how common the waltz used to be, nowadays songs in 3/4 are not in the majority. There’s something about the circuital nature of the “One, Two, Three” that just works. Waltzes also served as such a great way to enhance the theatrical components of a Taupier trapping moles, a Siren’s song luring pirates, and ultimately the great moments of the Blue Whale. For me, waltzes captured the intensity and delicacy of these moments perfectly. Personally, I always try to remember to take an idea and see if it doesn’t fit more comfortably into a different state than the original, which as of late has been trying it as a waltz. KCG: You incorporate different languages into your albums. Are you fluent in any foreign languages? 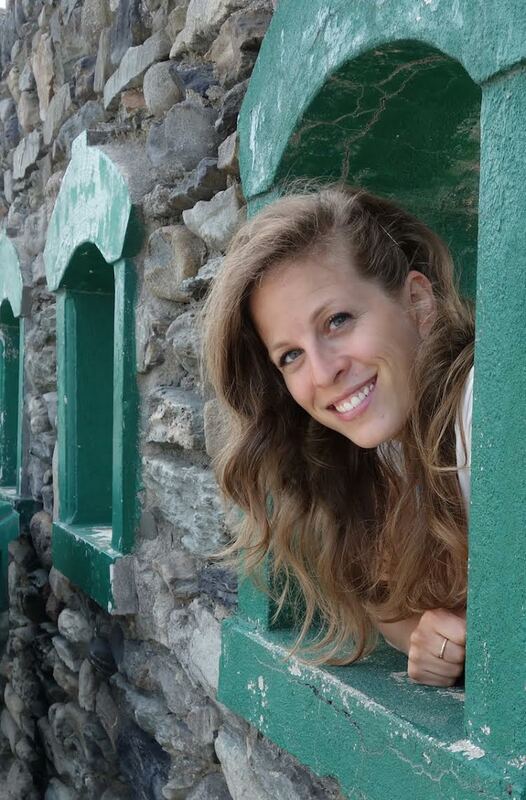 DE: I studied Italian and lived in Italy for a short stint. But, I do love the sound of French as well as Portuguese and I love a lot of music that has come from countries that speak these languages. For these past two records, I use words from French mainly because they feel the most like words that a wandering young mind might find intriguing. Also, there are just some words that sum up a feeling or a title that will never sound as elegant in English. KCG: The album’s artwork is stunning! How did you meet Brooke Weeber? DE: The artwork is truly a special component to the whole product. I was introduced to Brooke Weeber and her artwork through Kevin’s wedding invitations. Seeing as how he was making this project come to life, it seemed all too fitting to have her talents be a part of it. I reached out, we met for coffee and she made it happen. She’s kind of magic. KCG: Do you have a favorite part or parts of the album? DE: It’s really about the tiny details. There are so many hidden moments within the album, it’s hard to choose. If you listen very carefully to the end of “Valse de Taupier,” you hear the hammers of the piano closing back in after the big smash. I also really love the paper sweeping the ground at end of “Forget the Sea.” But those are only a couple of moments of the many that we buried in the project for our own listening enjoyment. KCG: What creative people are you inspired by? DE: First and foremost, my son. Experiencing life through the eyes of a small child is beautiful, silly and imaginative. It’s hard to pare down my direct influences, but right in this moment I look to musicians and community members like Anais Mitchell, 3 Leg Torso, William Basinski, Apollo Sunshine, The Barr Brothers and many classical influences. KCG: You channel Tom Waits in your songs. Is that somewhat of an alter ego for you? DE: He is certainly a huge influence, as can be almost anyone on a given day. But I think what I love the most about Tom Waits and what I seek to draw from his music, is how he glides between the duskier corners of the minor keys and somehow can maintain that feel even in the prettiest and most straightforward major key tune. There’s that and the fact that I modeled all of the backing “mole” voices as if he wanted in on the action. So, to answer the question, I would say the Pointed Man Band, in and of itself, is my alter ego just as that of being a dad is. The music and that reality came hand in hand and it still strikes me on a daily basis that I am a completely different person then I used to define myself and now my music as. KCG: The independent kids (kindie) music genre is expanding into a place that appeals to all ages. Both of your albums meet that criteria, pushing the boundaries of what is simply categorized as “music for kids.” What, in your opinion, is kids music? DE: That’s kind of a loaded question. Kids music, honestly, is any music that a child can connect with. Whether it’s jazz, classical, hip hop, rock, you name it. But if the question becomes “what do I feel is acceptable for kids to be listening to”? Then I would just try to eliminate music that promotes negativity and hateful messages. We all have such varied musical tastes and luckily there is so much diversity out there that we can allow our children to decide what they like or don’t. To expand upon this question again, in a different way, I believe it’s important to also have music that engages not just the children but also the different generations that help to raise the children we love. The school year has started and with that so many emotions are aflutter. Change is never easy, and this time of year really tests that notion out. Big time. The idea of a BFF when you’re a kid is so intense and so big. Finding someone you jive with and then spending most of your formative years with them, through all the developmental hustle and bustle, is even bigger. The trust, the intimacy, the safety of knowing someone gets you (and is going to break the rules with you…sometimes) is sacred. But what if they move away? 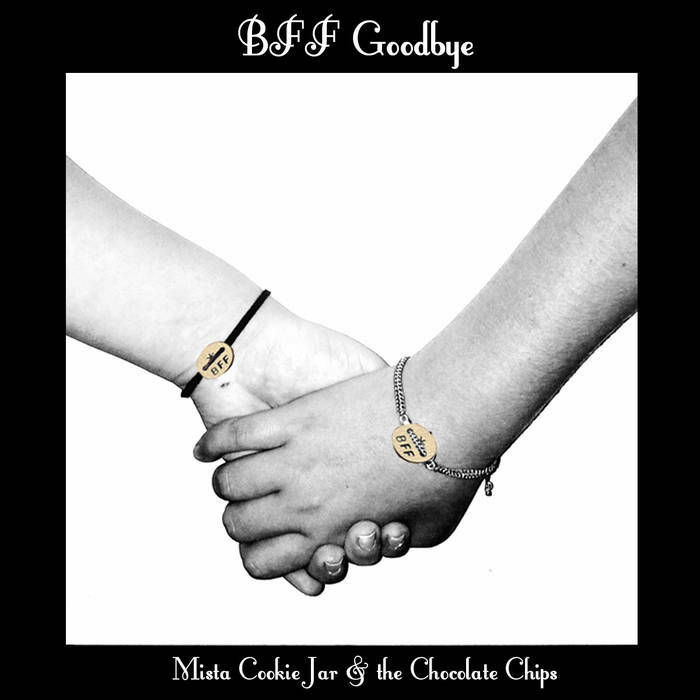 In his eleventh single (from his single-a-month release series), “BFF Goodbye,” MIsta Cookie Jar expresses the poignant and deeply conflicted feelings associated with having to say goodbye to your best friend. The song has a Dylan-esque vibe which suits the nature of this real-life story – MCJ’s stepdaughter Ava Flava and her best friend, Miss Mikyla, were faced with saying goodbye when Mikyla had to move away. “BFF Goodbye” balances the raw emotion of such a spirit crushing situation with beautiful ways of coping that make this track so touching. “BFF Goodbye” succeeds once again in offering a memorable embrace during a transitional time period. Check out My Letter to First Grade, featuring MCJ’s video for the single “My My My” which got me through the first day of school last year.